The longish twelfth day of the Coast to Coast footpath leads you on from El Burgo through a wild swathe of the Sierra de las Nieves Natural Park to the hilltop town of Ronda, the largest settlement which you encounter between the two oceans. Much of the walk is by way of forestry and farm tracks yet until you get within a couple of kilometres of Ronda you'll encounter few walkers or vehicles. The first section of the walk entails a long, steady climb parallel to the beautiful valley of the Río Turón. 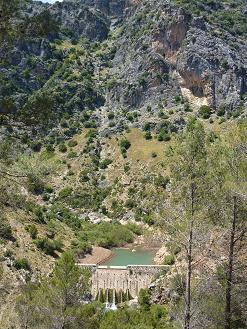 You then follow a narrow footpath which loops down then crosses the Turón's upper reaches (at this stage little more than a stream) before angling up to the remote farmstead of Cortijo de Lifa. A final steep climb leads to the highest point of the walk, the Puerto de Lifa pass: @ 1169m it's nearly twice the altitude of your point of departure. From here the track drops down to the broad plain on Ronda's eastern flank which marks the boundary between the Sierra de las Nieves and the Grazalama sierras. Cutting through Ronda's burgeoning north-eastern suburb of San Rafael you arrive at the neural centre of the town, the small square next to the town's extraordinary gorge and Puente Nuevo. Download the GPX files and instructions on how to load up files to BaseCamp. The walk begins in the lower square of El Burgo, La Plaza de Abajo, just below Hotel Casa Grande del Burgo (1). With your back to the hotel exit the square at its bottom right hand corner along Calle Ronda. The street angles to the left as it becomes Calle Las Erillas then arrives at a roundabout. Turning left past an ironmongers you come to the junction of the El Burgo/Málaga road. 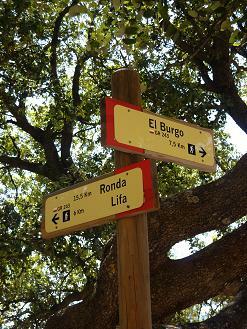 Turn left following a signpost for Málaga (2). After 150m you cross the Río Turón. Just beyond the bridge (3) cut hard right. Passing a sign for Ronda G.R.243 - 23kms you pick up a broad track which runs along the river's left bank. Soon you reach a fork with the left branch signed towards La Fuensanta. Ignore this: carry straight on along the main track on the G.R. 243. The track descends slightly as it heads towards the Cortijo de Hierba Buena. At a point where it becomes concreted for a short section you pass a spring (Water) to the left of the track (6). (1 hr 10 mins) The track soon runs past the Cortijo de Hierba Buena and its menagerie of goats, sheep, cats and dogs (7). Some 400m past the farm the track adopts a downhill course then levels as it runs closer to the river. Gently climbing once again you pass through an area of thicker pine plantation. As the pines thin out the higher peaks of the Sierra de las Nieves come into view to the south. Eventually, just beyond the point where the track passes beneath electricity lines, you reach a G.R.243 marker post by twin oak trees indicating Ronda 15,5 kms (8). 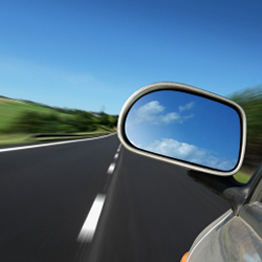 (1 hr 45 mins) Here cut right down a stony dirt track. After descending for 40m cut left again (9) onto a narrow footpath which angles down through the pines. Careful! When you reach the next marker post (10) cut hard right onto a less clearly defined path which drops down to through the gorse and cistus to a (dry) streambed which you cross at another marker post (11). 15m beyond the gate the path merges with a track leading down to the farm. Here bear right, pass by the farm's sheep and goat shed (18) then follow the looping track up to the top of the rise: you can cut corners. Crossing a first rise the track levels as it runs across an open swathe of land then, climbing once more, passes through a gate then crosses a cattle grid (19). A few metres beyond the grid you reach the highest point of the walk, El Puerto de Lifa, marked by a G.R. marker post Ronda 9 kms (20). (3 hrs 25 mins) * From here you'll be following the track to the outskirts of Ronda so you could return these notes to your pack. Continue along the track following a line of electricity posts. At a four way junction (22) by another farm head straight on. The track crosses a rise then descends. Soon the dirt road reverts to tarmac (23) (5 hrs), loops right then left, crosses a bridge (24) (168) then runs along the boundary fence of the Ronda feria ground. Here the road swings right past a supermarket and reaches the first of two footbridges. Cut left and cross the first bridge, La Paserala de La Libertad (25). Beyond the bridge, passing a bank, you reach a junction with the Avenida de Málaga (26). Turn left along this main thoroughfare into Ronda. Continue on past a petrol station, then the Guardía Civil headquarters, to a junction by Bar Los Cazadores where, to your right, you'll see an underground car park (27).